Vibha, a name synonymous with empowerment of underprivileged children, is also known for successfully hosting the FutureTech Cricket Tournament for 15 years in a row. Volunteers work feverishly to make each event better than the last. This dedication is as important as the generosity of the sponsors and cricket lovers and the enthusiasm of the teams every year. Of course, the added attraction of winning the gigantic rolling cup is always a huge incentive. This year's event was inaugurated on April 20, 2013 at East Roswell Park by Mr. Sravan Vellanki, President and CEO of FutureTech. More than 400 players registered and 42 teams were in the draw. After the first couple of weeks of elimination rounds, the teams for the semi-final were Gallega Blazers, Rebels United, RapidIT Royals, and FutureTech. The stage was set for an exciting final. Gallega Blazers started superbly with a flurry of fours and sixers from their star batsman Vijayendran Ravichandran who dispatched the ball to all corners of the field. Some exciting batting by Niaz in the end brought the game close, but not for long—the Gallega Blazers emerged victorious. Cheers and applause erupted as they celebrated a well-deserved victory and shook hands with the umpires and the opposing team. Coordinator of the event Durgesh Das invited the dignitaries on to the stage for the prize distribution ceremony: Sravan Vellanki, CEO FutureTech; Pramod Sajja, CEO of Paramount Software; Srinivas Nimmagadda, CEO of Vensai Technologies; Ramesh Maturu, President of Pyramid Consulting; Ravi Kandimalla, CEO of Everest Technologies; and Shreesh Rao of Manhattan Associates. Vibha had raised $30,000 for 1000 children in various projects in India. The 2013 tournament saw a lot of firsts, notably the live streaming of draw of the games and the use of professional umpires for final round games. Gallega Blazers and Rebels United had played some scintillating cricket to get to this point, notably the nail-biting quarterfinal game by the Rebels against RapidIT Rangers. Batting first, Gallega Blazers started slow due to some tight bowling by the Rebels. The last 3 overs saw some gutsy hitting by the Blazers that took their score to a respectable 51 in the allotted 10 overs. The Rebels came in to bat with a good bit of confidence owing to their previous performances in high scoring games and the modest target. The Blazers, however, were more than prepared to defend their total; they bowled and fielded superbly to restrict the Rebels to 38 runs. The second semi-final pitted last year’s winners RapidIT Royals against last year’s semi-finalist team FutureTech, making it the most awaited game of the tournament so far. FutureTech batted first and accumulated a solid 60 in 10 overs with a brilliant 31 runs by Man of the Match, Kalyan. RapidIT Royals who came into the tournament with a solid reputation and an excellent run so far—highest quarter final team score of 79 and highest opening round score of 104—were the favorites. But the FutureTech team played some excellent cricket by getting wickets at frequent intervals and restricting the Royals. 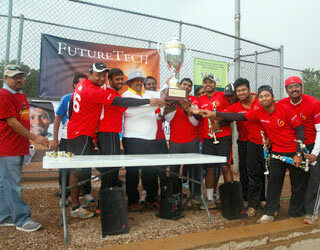 The Royals exited gracefully as the FutureTech team celebrated their semi-final victory. Niaz was noted for exciting batting. The stage was set for an exciting final. The weather had cooperated so far and everything had worked out perfectly. The sky was overcast with the sun peeking out every now and then but it had been dry all day. The teams and umpires were introduced to the Chief Guest and main sponsor Mr. Sravan Vellanki by event organizers. Everyone posed for pictures before the big game. Gallega Blazers won the toss and chose to bat first. They started superbly with a flurry of fours and sixers from their star batsman Vijayendran Ravichandran who dispatched the ball to all corners of the field. By the time the allotted 10 overs were up, they had amassed 72 runs at an average of over 7 which was not a very big total and certainly attainable by the FutureTech team. Everything went the Blazers way: they bowled extremely well and in the end proved too good for their opponents. Some exciting batting by Niaz in the end brought the game close, but not for long. Niaz perished trying to slog yet another good ball and lost his wicket and FutureTech’s last hope in the process. The Gallega Blazers emerged victorious. There were cheers and applause as they celebrated a well-deserved victory and shook hands with the umpires and the opposing team. Sri Krishna Vilas supplied delicious food on all three days. Sanjay of Rapid IT Royals. Vivin K Viswambaran of Gallega Blazers. Sharankumar Nataraj of Rebels United. Vivin K. Viswambaran of Gallega Blazers. Vijayendran Ravichandran of Gallega Blazers. The Rolling Trophy was presented to the winning team by Mr. Sravan Vellanki. Left: Anoop Sinha, one of the organizers, enjoying the day.